Scout Urling's delectably flavored organic matchas are treats for both experienced tea lovers and newbies. When tea virtuoso Scout Urling turned her attention to matcha, exquisite flavor was written in the tea leaves. 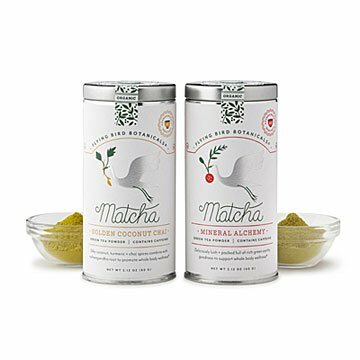 Smooth, complex, and unsweetened, these two flavored matchas are delicious introductions for powdered green tea newbies, and special treats for tea lovers craving something new. Both are made with Tencha leaves, a shade-grown tea prized for its delicately refined flavor. Enjoy them hot or iced, plain, or with honey or non-dairy milk. Organic ingredients sourced both locally and globally. Hand blended in Bellingham, Washington. Golden Coconut Chai: One of Scout's personal favorites. A delectable, nourishing blend of silky coconut, and turmeric, flavored with chai spices. Mineral Alchemy Matcha: Deliciously lush and packed full of rich, earthy, super nutritious botanicals. Each tin contains approximately 60 servings.